This exhibition features over 30 Hermannsburg pottery pieces, gifted to the Moreton Bay Regional Council. The pots were made in Hermannsburg, an Indigenous community based in the Northern Territory and depict the lives of the artists, flora, fauna and draw from traditional Aboriginal techniques, the Australian landscape and European influences. 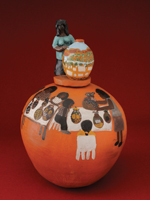 Image: Irene Entata, Hermannsburg Potters (detail) 2002, terracotta with underglaze. Courtesy of Al Sim.